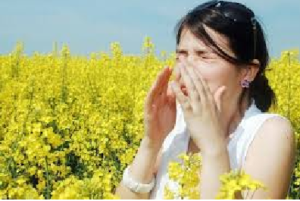 Do you or your loved ones suffer with hay fever this time of year? If so, perhaps you can relate to this personal story. For four and half decades of my life, every May and June was miserable. Itchy, swollen eyes and throat, runny nose, congestion, and violent, exhaustive sneezing defined my spring season. Growing up in Kamloops while the sage brush bloomed, and the lilacs blossomed, I wilted. Treatment consisted of prescription and over the counter allergy medicines. In my case, there was little relief with drugs, save an anti-histamine induced stupor. I remember many vacations spent cocooned in the car while family and friends enjoyed the outdoors. The strange thing is that no matter where in the world we lived, (including Florida, Italy, and several U.S. states), and no matter what type of flora flourished, (from desert to tropical), I still had this persistent and prolonged aggravation every spring. The following spring was symptom free for me—the first in 45 years! What a blessed relief and how much I now enjoy springtime! Naturally, you can imagine how this experience would change my previously prescribed viewpoint about allergies as well as reshape my nutrition career. Does this make you wonder about your seasonal allergies? Could your suffering be optional too? Is there a list of solvable factors creating stress in your immune system triggering it to overreact to otherwise harmless plant pollens in the air? Are your symptoms from one or more of these factors? An under or malnourishing diet which does not provide your body with the right raw materials it needs to rejuvenate rapidly and completely? An accumulation of environmental toxins, such as metals and chemicals, including medicines, burdening the liver and kidneys, and contributing to a heightened state of alertness in your immune system? The beauty of it is that each of these factors can be changed or ameliorated. If I could eradicate my lifelong allergy symptoms why couldn’t you? Is it time for you to make a change and spring into action? What better time than Spring for new beginnings? Cathy Lidster, thanks for the article post.Really thank you! Great.